Never try and eradicate a wasp nest yourself. You will be severely attacked. You can only approach a live wasp nest if you are wearing a bee suit. Even then our wasp eradication technicians are regularly stung. The treatment itself is done with a powerful insecticidal dust. If we can see the nest, a lance is pushed into the nest and the dust administered into it. The wasps actually help to move this dust around the many layers of the nest themselves, killing all the adults and larvae. In this situation, we are offering guaranteed wasp nest eradication. If the nest is in a cavity and we can’t reach it with the lance, then we will fill the cavity as much as we can with a large amount of the insecticidal dust. Because we are treating blind here and cannot be certain that the dust is getting into the nest, this treatment cannot be guaranteed in the same way. However, it still usually works first time and if re-treatments are needed, then these are carried out at a reduced rate. To help us reach difficult areas, all our operatives carry pole extensions to the lances and are trained in working at heights safely. Wasp nests at your property or business are a nuisance at best, and a potential serious danger at worst. 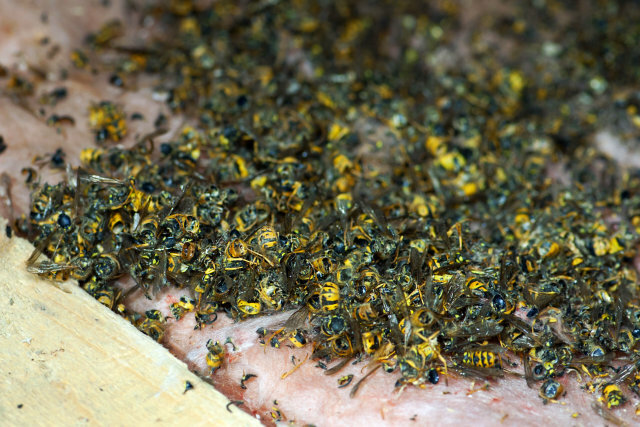 We often get asked how to get rid of wasp nest; never try getting rid wasps yourself. 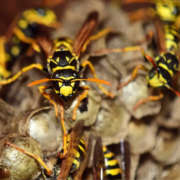 A wasp nest can contain thousands of individuals and the colony will quickly switch into attack mode if threatened. A wasp nest treatment should only be considered with the correct protective equipment such as a bee suit. Even then our qualified wasp eradication technicians are regularly stung. Within two hours there should be a dramatic decrease in activity and within 48 hours the whole nest should be dead. Our trained technicians can discuss long term wasp prevention plans with you if you wish.